Research finds financial burdens of cancer care make it hard for patients to focus on recovery. Numbers don’t lie and a recent survey conducted by the Association of Oncology Social Work (AOSW) shows that more than one half of cancer patients indicate cancer costs negatively impact their focus on recovery. Those who work with these patients know the stressors firsthand and understand the negative impact they can have on family, caregivers, and most importantly the patients. Dedicated to the enhancement of psychosocial services for people with cancer and their families to help them cope with the practical, financial, emotional, and social concerns of living with cancer, the AOSW’s survey results are part of an ongoing effort by the association to increase understanding and support for people with cancer and their families. Conducted in the fall of 2009, the centerpiece of the project consisted of three surveys—one with 169 cancer patients, another with 131 caregivers, and a third with 153 oncology social workers. From these surveys, the AOSW collected valuable information about the different financial issues patients face, how they’re coping with these issues, and how finances impact their ability to focus on recovery. The voluntary social worker survey participants were from the AOSW membership list and had worked with oncology patients for an average of 13 years. Seventy-four percent worked with more than 100 oncology patients each year, and 64% indicated they worked with patients before treatment, 96% during treatment, and 71% posttreatment. According to the survey, 66% of patients with major financial challenges suffer depression or anxiety, 29% delay filling prescriptions due to financial pressures, and 22% skip doses of their medications. Sixty-three percent of oncology social workers surveyed said financial issues reduce patients’ compliance with their cancer treatment even though that treatment is key to their recovery. Additionally, 40% of patients reported depleting their savings, almost 30% reported dealing with bill collectors, and 54% of those handling a major/catastrophic financial burden said it had become more difficult in the past year to afford treatment. Furthermore, 68% of cancer patients and caregivers surveyed reported that the patient is experiencing financial hardship due to medical bills, and 55% of all cancer patients surveyed said the stress of dealing with costs negatively affects their ability to focus on their recovery. “Managing the costs of cancer treatment is difficult for many patients and families coping with cancer and may cause distress and worry and make it more challenging to follow their doctors’ prescribed treatment course,” says Carolyn Messner, DSW, MSW, LCSW-R, ACSW, director of education and training for CancerCare and president of the AOSW. Halfway through her treatments, Perniciaro was told her insurance would no longer pay. So, unable to pay out of pocket, she stopped going. “I couldn’t afford the treatment and I told the hospital the only way I would come back is if they would accept what the insurance company would pay,” she explains. The hospital agreed at the time and after several weeks, her treatments resumed. But in the end, Perniciaro ended up with the fight back in her hands. Sadly, many people she befriended and spoke with during her treatments were also struggling to make payments. Comprehending a cancer diagnosis is tough, often forcing thoughts of what treatment will cost to the back burner. The AOSW research found that only 36% of patients have discussed the cost of treatment with their oncologist, and only 16% of patients and caregivers report that they believe their oncologists give a lot of thought to the financial implications of the treatment they prescribe. In fact, only about one half of patients feel comfortable speaking with health professionals about financial issues. Often the reality of cost doesn’t sink in until patients are undergoing treatment, sending them into a tailspin that leaves them thinking less about their recovery than about how they’re going to pay for everything. This is where a social worker should be involved to help alleviate some of the financial concerns. But this doesn’t always happen. In the research, 69% of social workers said they see themselves as cancer patients’ primary resource when dealing with the financial concerns of their cancer treatment. Actually, the majority of social workers surveyed indicated that they have a significant impact in helping oncology patients handle their cancer-related financial problems. 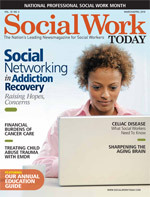 However, only 34% of patients report actually utilizing a social worker as a resource. Such was the case for Perniciaro. Throughout her entire ordeal, not once was she offered assistance via a social worker. If she had been offered a social worker’s services, this current research shows her ability to cope with her illness and subsequent healing would certainly have been less impaired. • American Cancer Society’s Health Insurance Assistance Service (800-ACS-2345): The call center staff have helped some 21,000 people in 36 states with insurance and other financial problems. They often refer people to national organizations such as the CancerCare Co-Payment Assistance Foundation which helps patients cover the cost of copays for medications to treat certain cancers, or the HealthWell Foundation which helps patients cover their out-of-pocket medical expenses. • Drug assistance programs: Organizations such as NeedyMeds and the Partnership for Prescription Assistance can help identify state, drug company, and disease-specific programs that may cover some of the cost. • Provider discounts/charity care: Some doctors and hospitals may be willing to give their patients a break but the patients must ask. One of the most comprehensive listservs out there, SWON offers an almost daily interchange among oncology social workers looking for ways to help their patients. From how to afford copays to finding a free cleaning service for patients with cancer, professionals can connect with each other and share what works and what doesn’t. Lastly, for social workers who want to see their profession acknowledged by more oncology practices and hospitals, it’s time to get the word out. “There are so many cancer treatment centers without oncology social workers, and that’s something we need to improve,” says Burg. So is there hope on the horizon? According to Burg, The Dorothy I. Height and Whitney M. Young, Jr. Social Work Reinvestment Act that’s currently in legislation on Capitol Hill is designed to address challenges to the profession, including staffing issues, safety concerns, significant educational debt, and comparatively insufficient salaries, thereby helping ensure that millions of individuals, families, and communities throughout the nation can continue to receive competent care. The hope is this legislation will create the foundation for a professional workforce to meet the ever-increasing demand for the essential services that social workers provide. For more information on the AOSW and how to become a member, visit www.aosw.org. • Treatment costs negatively impact the ability to focus on recovery for 87% of patients with catastrophic/major financial burdens due to cancer treatment, and 75% of these patients constantly worry about financial issues due to cancer treatment. • Almost one half (46%) of patients who have experienced a financial burden from their cancer have cut back on necessary expenses such as food to pay for cancer treatment. • Twenty-four percent of respondents indicated that they suffered a relationship issue in their efforts to afford cancer treatment. • Six percent sold a home or relocated due to the financial stress and 3% experienced a home foreclosure. • Fifty-six percent of patients were not at all prepared to handle the financial burden of cancer, while only 7% indicated they were completely prepared for it. • One half of all caregivers agree that they try to shield patients from the financial aspects of cancer treatment. • Social workers report that relapsed patients have a much better understanding of the treatments and medications covered by their insurance vs. newly diagnosed patients, signaling that the more patients deal with their insurance plans, the greater their understanding of their treatment options. • Multiple myeloma patients spend almost twice as much on prescription drugs as the average cancer patient.